Authenticity, truthfulness and searching for one’s soul play the most important role in the brand new Jameson TV spot. The family motto „A bit less fear and a bit more life“used in the campaign is the part of the new communication strategy as well. Authenticity, truthfulness and searching for one’s soul play the most important role in the brand new Jameson TV spot. The family motto „A bit less fear and a bit more life“used in the campaign is the part of the new communication strategy as well. The campaign is intended to encourage young people to live a life that is worth living, take the initiative in an effort to explore the unknown and beat others to the punch – just like the founder of the Jameson brand, John Jameson did back in 1780. The Sine Metu concept has been the family motto since 1780 when the young John Jameson made up his mind and left his comfort zone in Scotland, took a giant leap into the unknown and established a new distillery in Dublin. Not only did John Jameson as well as all his family live by this motto, they also worked hard and by believing in themselves they created a whiskey brand that is an absolute bestseller all around the world. That’s the very reason the Sine Metu concept has been posing on every bottle of Jameson whiskey for decades in an effort to celebrate this powerful philosophy. „We are planning on getting actively engaged in various other communication tools used in already existing events which have already been put to concrete concepts adopting the Sine Metu feeling of John Jameson. As a first step our current communication targets the premier launching of the new TV spot on our Facebook page. 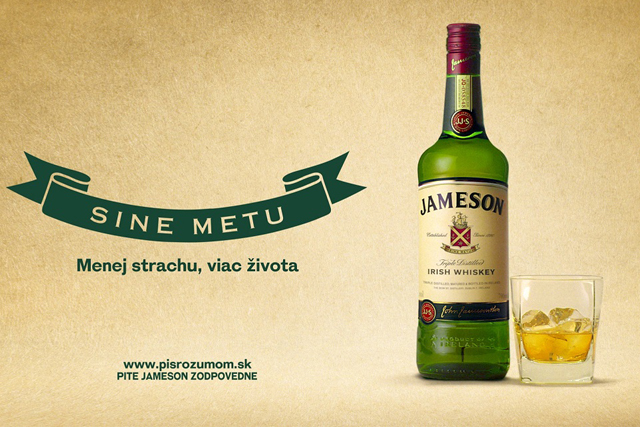 As a follow-up we supported it in TV channels in Slovakia“ Martin Rusko, Jameson marketing specialist disclosed. Raising awareness of the Sine Metu concept is an ongoing process that will materialize in intensive communication in social networks that will provide support to plug the motto at events in bars, restaurant and shops. An untraditional activation from Canada will definitely serve as an inspiration – we are talking about the combination of the spoken word and the Sine Metu design, the brainchild of designer, man of letters and illustrator Ben Johnston and Chris Tse, a motivator and a word artist. Sine Metu is more about discovering the world around us and in us than anything else, overcoming sneaking fear and leaving the well trodden path we are supposed to take while finding our own. That’s the very concept the new TV spot focuses on currently being aired on Slovak TV channels.